So, you are looking at starting a career in networking, but where to start? There is a wide range of vendors, each with their own certification. There is CompTIA's Network+, which is a vendor neutral certification, meaning that it is not tied to any one manufacturer, you can learn the basics of the majority of networking, covering many topics, but how can you get hands-on experience if it is truly vendor neutral? Then we have the vendor-specific ones from Cisco and Juniper (there are others, but these are the main ones). Both Cisco and Juniper have the lions-share of the network, but for the beginner, Cisco's CCNA certification is a great place to start. 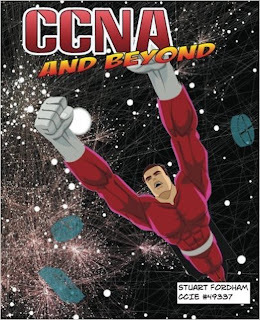 Why start networking with the Cisco CCNA? Cisco equipment is easy to pick up on the second-hand market. Routers and switches can be picked up very cheaply on eBay. Cisco equipment is easy to run in a virtualized environment. Platforms such as UNetLab and GNS3 make for a great way of learning how to network. We'll post about how to get started with UNetLab in the coming weeks. Cisco is hugely popular and demand for CCNA engineers remains high. About two years ago I posted on my other blog about the demand for CCNA, CCNP and CCIE engineers. This has not changed much in the last two years. The average CCNA job pays around £42,500 in the UK, in the USA the CCNA salary can vary anywhere between $53,000 to $89,000. By comparison my first IT job salary started at £12,500! Once you have your CCNA you can then go forward and gain your CCNP (Cisco Certified Network Professional), or look to specialize in network design (CCDA/CCDP, for Design Associate and Design Professional respectively). Networking can be really good fun, and very rewarding. It can also be extremely frustrating at times, but then so can any career. This site is designed to help you find your career in networking a fun one.